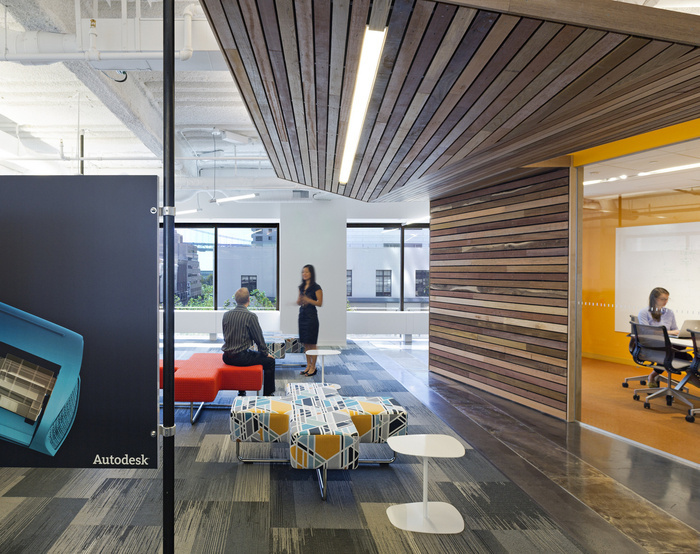 Gensler has recently completed a new office space for world leading 3D design software company Autodesk. The LEED Platinum-rated office spans 71,000 square feet across three and is located in San Francisco. The world leader in 3D design software for manufacturing, building, construction, engineering and entertainment, Autodesk asked Gensler to envision a new office space that would span three floors surrounding a daylight atrium. It needed to showcase their evolving software technology, reflect the uniqueness of local culture and materials, create a “buzz” through the energy and interaction in the space, and highlight their increasing presence in downtown San Francisco. The design team had the additional task of physically connecting Autodesk’s existing space in an adjacent building to the new one – all while reinforcing a highly functional and collaborative workspace. The project design concept juxtaposes a pre-AutoCAD building (when architects designed with pencils and slide rulers) with architectural forms visualized using current Autodesk software, creating a space that is a “celebration of the past contrasted with the possibilities of the future.” Wall and floor graphics interpreted from the streets of San Francisco and Autodesk’s own Mold Flow computer modeling define and energize the corridor and main circulation path along the core. Supplementary colors throughout the space were inspired by digital and engineered projects enabled by technology. The large communal “TownSquare,” strategically located at the main entry, functions as a gathering space for large all-hands meetings, casual collaborative work, and a place to grab a cup of coffee. 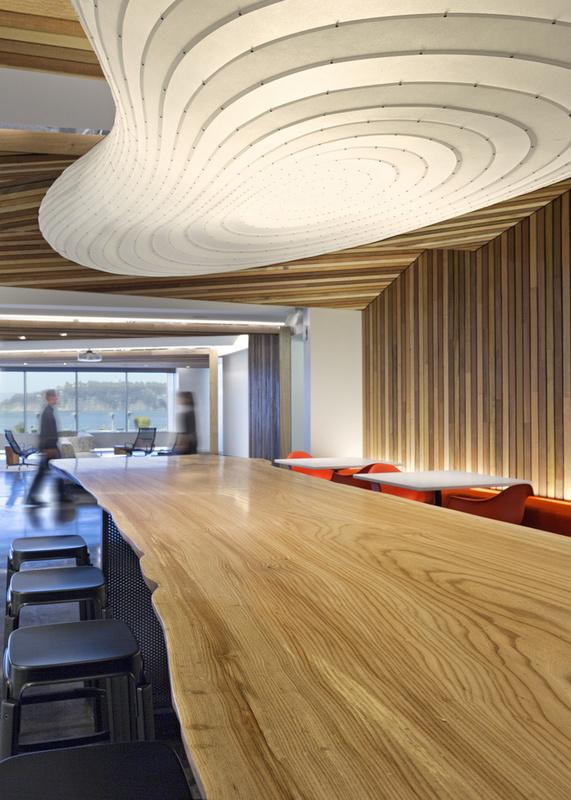 The folded wood ceilings in the space visually connect the open office areas across the core, while framing views out toward the Bay and daylight. The three glowing yellow, blue and orange Autodesk game room ceilings are visible across the floors and anchor the One Market Plaza atrium, broadcasting Autodesk’s presence in the building. A rhythm of built “pavilions” align with the exposed structural bays and help to divide the open office area from the main corridor path. Each one holds a combination of meeting space and smaller focus rooms. The workspace is subdivided further with recycled industrial pipe white boards that anchor open team areas to help facilitate ad-hoc brainstorming and collaboration. The backside of the white boards provide strategic placement for ever-changing Autodesk branding. Proximity to a variety of breakout spaces that offer both open/closed and casual/ formal places to meet lends itself to the impromptu spirit of the way Autodesk employees work. The base finish palette – a backdrop of white and charcoal, is indicative of the Autodesk brand. Interspersed compound wooden forms and bright splashes of color reinforce an assortment of collaborative spaces across the floor plate. By utilizing Autodesk technology to navigate the complex architectural geometry of the space, the team was able to achieve maximum ceiling heights and increase views to the outdoors. Environmentally sourced materials were integral to the design to help tie the new and existing spaces together. Undulating ceiling forms created with salvaged wood from local shipping pallets, stained concrete floors, 100% recyclable polypropylene dining chairs, along with other locally sourced furniture, respond to the client’s desire for environmentally responsible material selections. The end result is a workplace that not only emphasizes the company’s dedication to the environment – all three floors are certified LEED Platinum – but is an inspiring place for collaborative innovation.